Immerse yourself in the energy, diversity and vibrancy of downtown Chicago when you study at Medill’s Chicago location. Medill’s Chicago campus is located at on the 16th floor of 303 E. Wacker Drive, close to iconic Chicago destinations such as The Art Institute of Chicago and Millennium Park (home of Cloud Gate, a.k.a. “The Bean”). Journalism master’s and IMC Part-Time master’s students take classes at this location. The space, which opened in 2016, offers expansive views of Lake Michigan, Navy Pier and the Chicago River. It’s close to many other buildings, such as Tribune Tower and NBC Tower, as well as large companies such as Leo Burnett, Starcom Mediavest Group and Energy BBDO. In addition, many Medill alumni work within walking distance of Medill Chicago. The space boasts open, technology-enabled, multi-use workspaces and a state-of-the-art broadcast studio. We regularly host alumni events, speakers and professional workshops in the space. It also has small work areas and two kitchenettes, so you can work individually or in groups on assignments and project. Students work in one of the collaborative open spaces at Medill Chicago. This convenient location serves as a home base that gives graduate journalism students the opportunity to cover the city’s government and politics, arts and culture, business, nonprofit sector, sports, research, innovation and more. In a city like Chicago, there’s always a plethora of newsworthy events to report on, not to mention countless experts to interview. Medill Chicago’s location is convenient for IMC Part-Time students who work downtown during the day and stay downtown for classes in the evening. 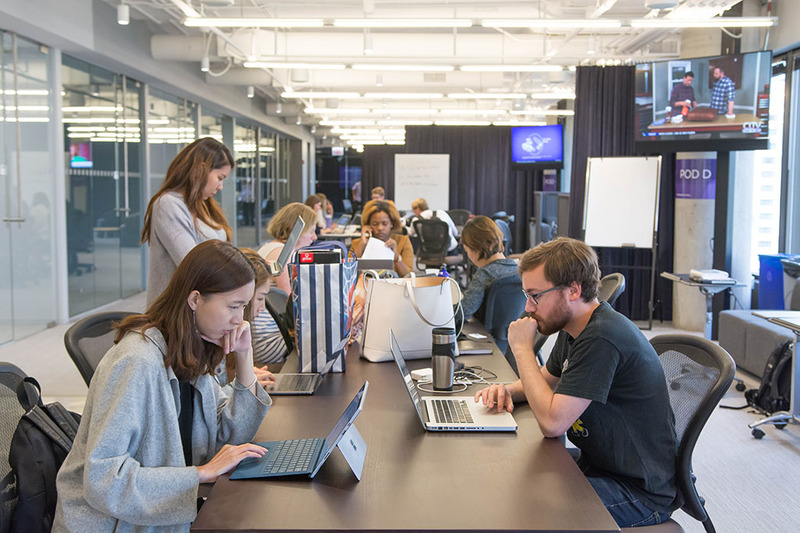 It is also an ideal hub as they connect with Chicago’s marketing communications industry professionals, many of whom are Medill IMC alumni.